Hanoi (VNA) - Prime Minister Nguyen Xuan Phuc has spoke highly of the close and effective cooperation between public security forces of Vietnam and Cambodia in preventing and combating crimes, especially crimes related to national security, drugs, economic activities, cyber crimes and human trafficking. At a meeting with Cambodian Deputy Prime Minister and Minister of Home Affairs Krolahom Sar Kheng in Hanoi on August 17, PM Phuc held that amid rapid developments of the world and regional situation, the public security forces of Vietnam and Cambodia should continue working closely to effectively implement agreements reached by senior leaders of the two nations on ensuring political security, and social order and safety in each country. The two sides should coordinate to foil all schemes that are aimed at driving a wedge between Vietnam and Cambodia and undermining their friendship and solidarity, he said, urging the forces to promote the efficiency of existing cooperation mechanisms and support each other at international and multilateral forums. PM Phuc also proposed both sides create favourable conditions for Vietnamese and Cambodian nationals to settle down in each other country, suggesting that Cambodian authorities continue taking suitable measures to ensure legitimate rights of overseas Vietnamese in Cambodia. For his part, Krolahom Sar Kheng said that his visit is part of activities to mark the 50th anniversary of Vietnam-Cambodia diplomatic ties and the 72nd traditional day of the People’s Public Security Force of Vietnam, which serve as an opportunity to strengthen cooperative relations between the two countries in general and the public security forces in particular. He highlighted the efforts made by Cambodia’s Ministry of Home Affairs in conducting agreements of the two countries in fighting crimes in border areas, thus maintaining a shared borderline of peace and stability. 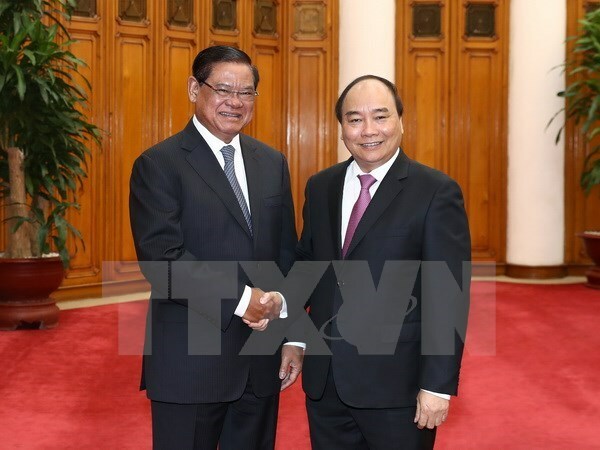 The official thanked the Party, Government and Ministry of Public Security of Vietnam for their valuable assistance to the Cambodian people, affirming that Cambodia will create favourable conditions for Vietnamese nationals in the country.